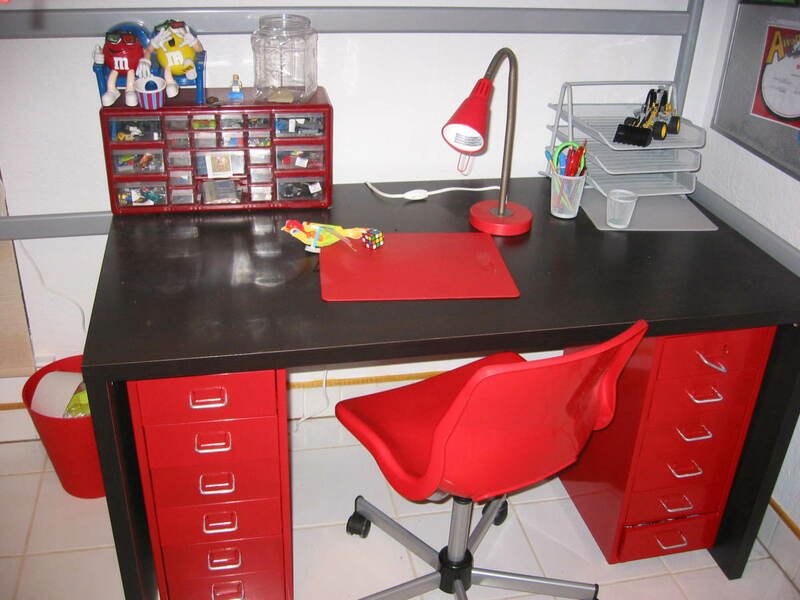 Do you have a Lego-obsessed kid? Me too! When he wanted a Lego decorating theme, I found that the brand merchandise was expensive and sometimes not exactly what we wanted. 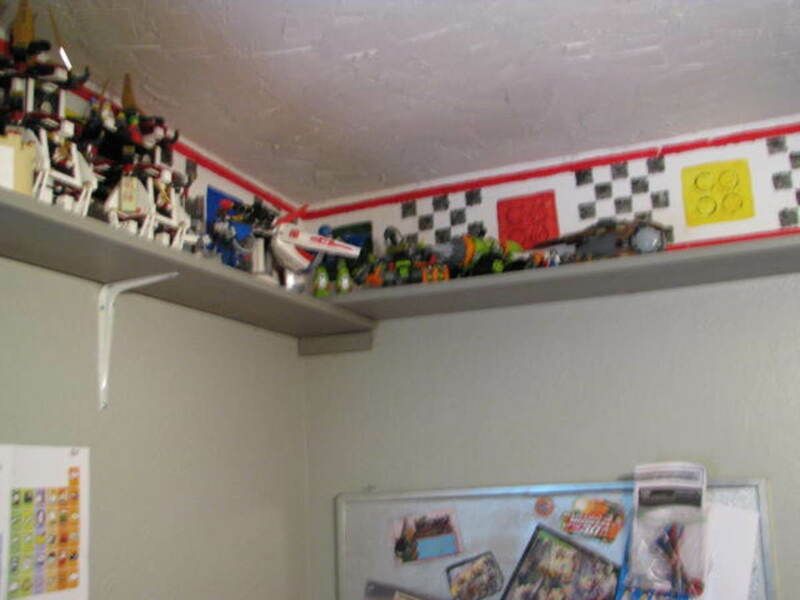 To make an affordable theme room for our son, Brendan, we came up with our own designs and focused on making a room that allowed him to store and display his large collection. The room we made for our son has gone through different phases as we added more storage and shelves for display. None of these projects took more than a few hours, and they weren't very expensive. 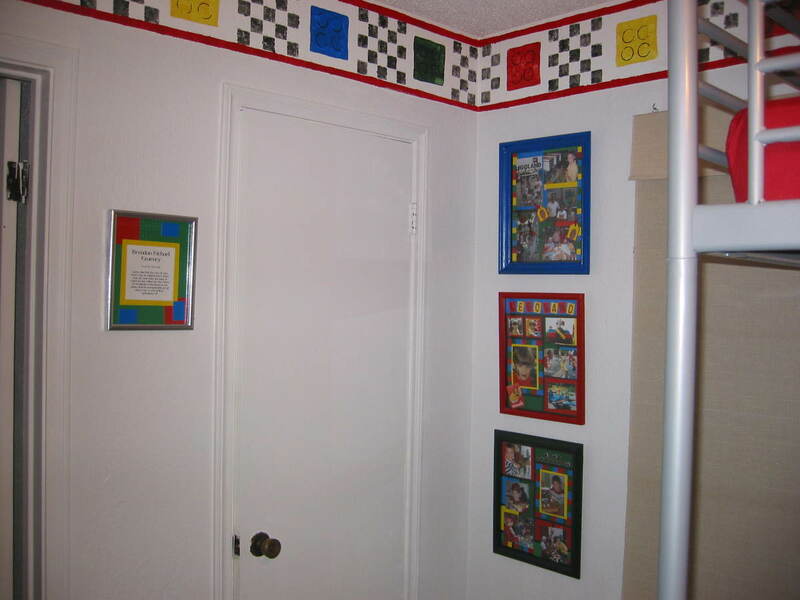 One way to make a theme room is to paint the walls in primary colors. My son's room is small and I didn't want to make it darker with paint, so we painted the walls and ceiling grey and made a Lego border. 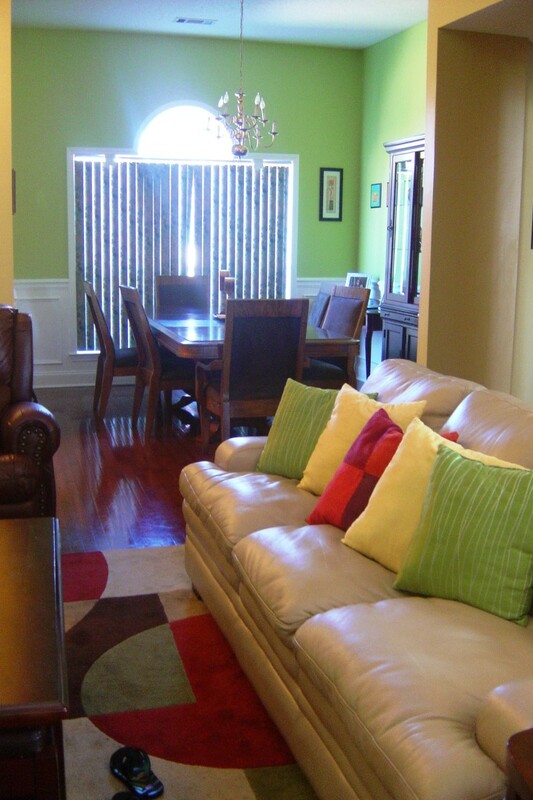 You could do this border in the middle of the room, but we did it at the top so it could be seen easier. This was very easy to do and you don't have to be a painting expert. 1-2 inch bottle cap (depending on the size of your bricks. Put a line of painter's tape on the ceiling all around the room (This is easier if you have another person helping you to hold one side as you measure the wall about 6 feet down). Measure down 1 inch and put another line of tape all around the room. Use a brush to paint the space between the two pieces of the tape red. Measure down 12 inches and put another line of Tape all around the room. Measure down 1 inch and put another line all around the room. Paint in between those two pieces of tape with red. Lego Bricks. The squares can be any size. 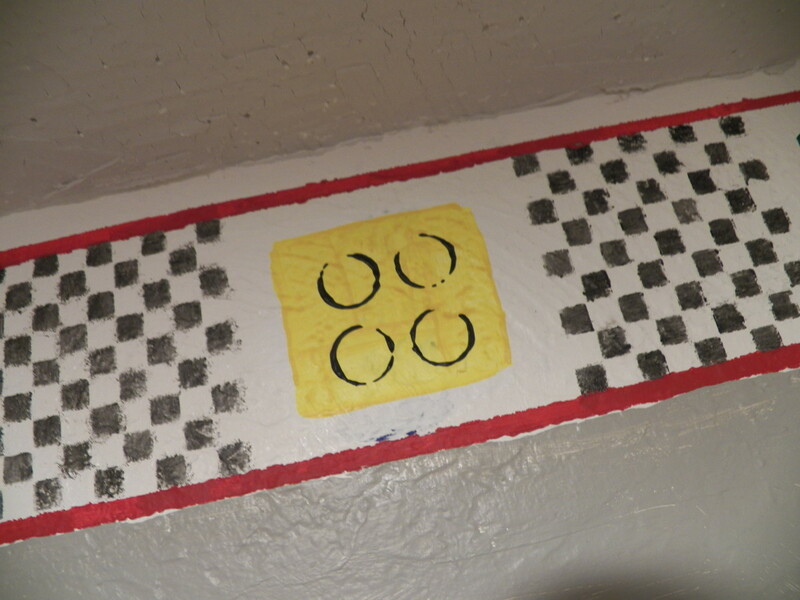 We made ours 9" squares which are separated by a black checkerboard (my son liked the Racers set at that time). You could do all bricks and do squares and rectangles. Make a cardboard template of the size of bricks you want to use. Measure your wall and space out your bricks evenly. We actually just marked out 1-foot intervals all around. Trace around your brick templates on the wall. You can either freehand paint it, or use painter's tape around the edges to make them neater. 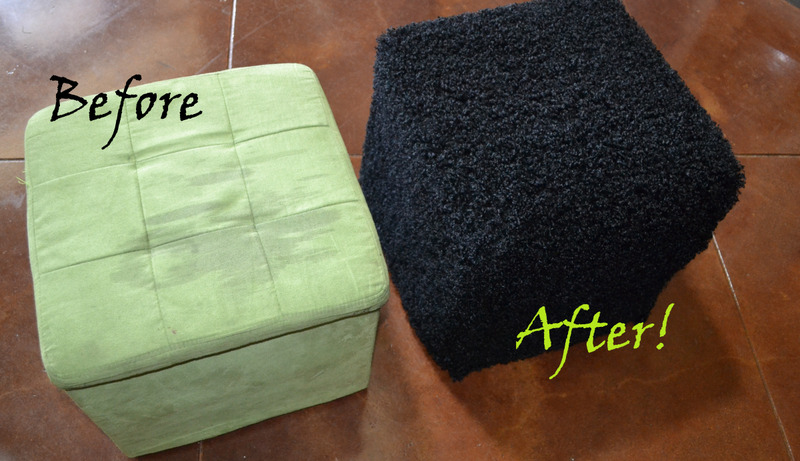 When they are dry, use the bottle-cap top dipped in black paint to make the circles on top of the brick. You can even write "Lego" on one if you want. 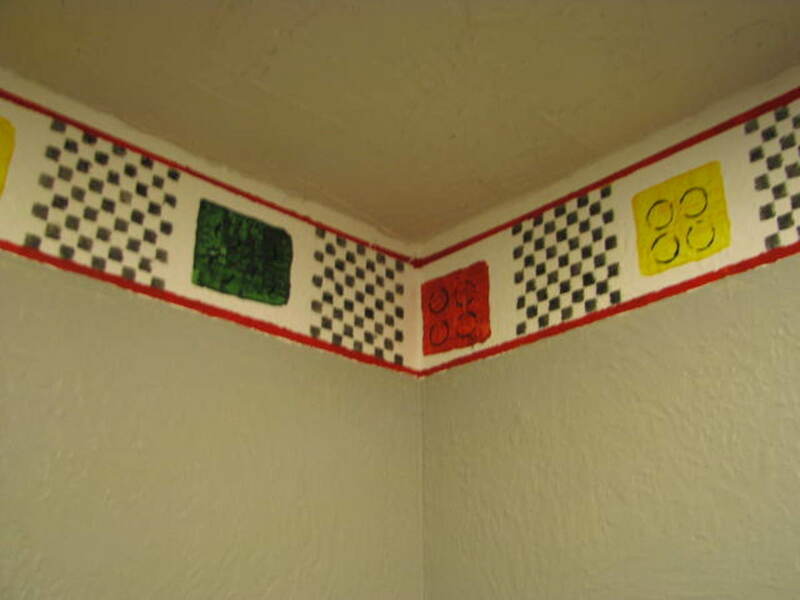 Tape the checkerboard stencil to the wall. Use stencil paint and a stencil brush to tap the black paint on the stencil (check to make sure you are doing this at a 90-degree angle so the brush doesn't get underneath the stencil. When you are done, lift the stencil carefully up. Wipe off the stencil before going to the next section of wall. Embossed Lego paper can be used to do a lot of decorations very inexpensively. The paper comes in 12" by 12" sheets in a variety of colors. Sometimes you can find this at a scrapbooking store, or it is available inexpensively on Amazon. 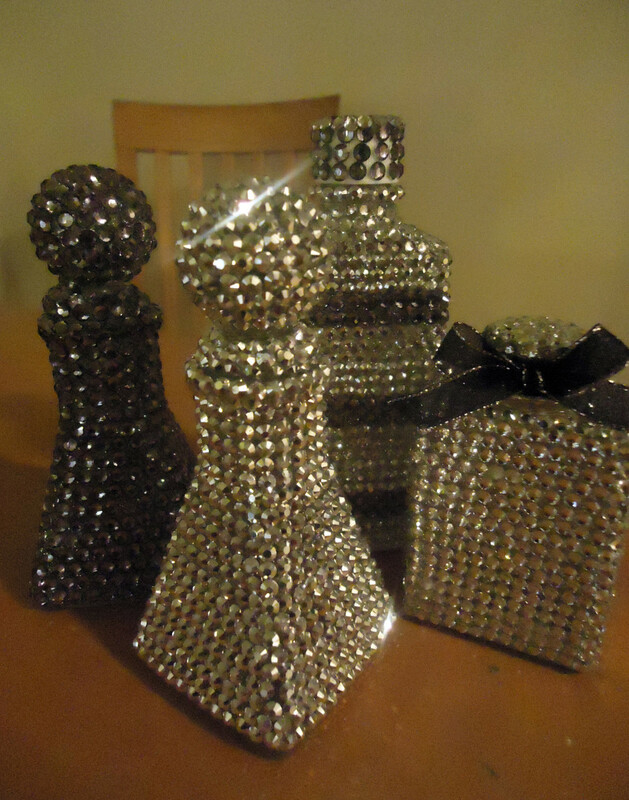 For less than $10.00 you can get enough to decorate a whole room. Here are some of my ideas. I actually didn't think this would last very long, but my son has had it on his wall for over 8 years now and it still looks great. 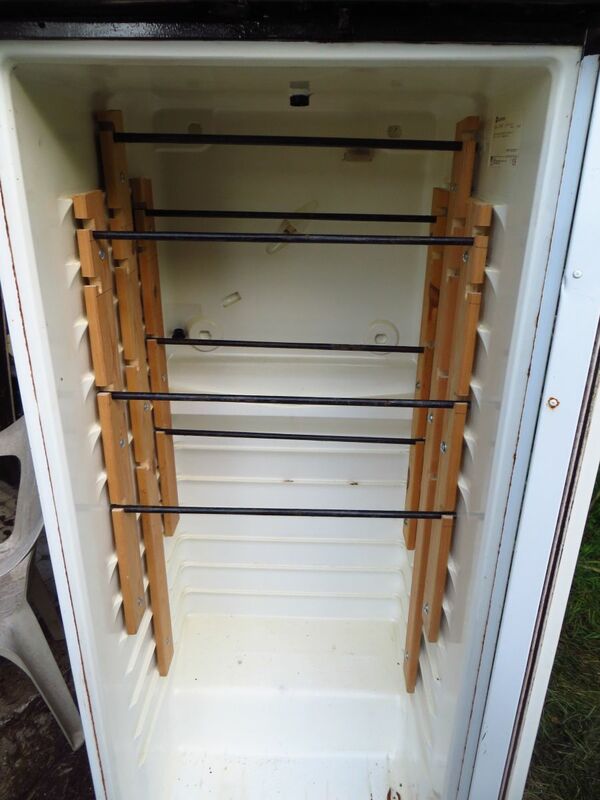 The trick is to cover it with Mod Podge to make it easy to clean. This is a very simple craft you can make in 10 minutes. 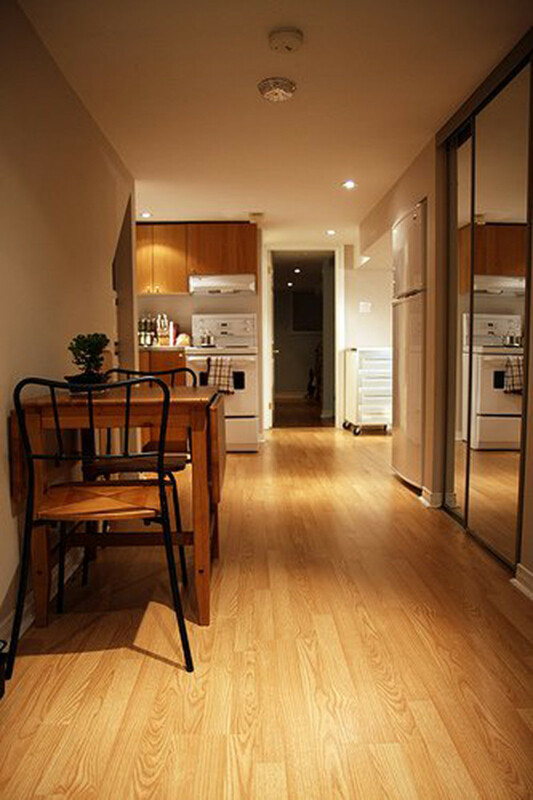 Take the light switch off the wall (be sure to turn off the electricity first). Put the light switch face down on the Lego paper and trace around it (including the holes for the light switch and screws). You will want to cut the paper out about 1/4 to 1/2 inch larger than the traced line (so you can turn the paper under the edge. Use sharp scissors or an Exacto knife to cut exactly around the light switch hole(s) and the holes for the screws. Put Mod Podge or glue (glue is not as shiny) on the front of the light switch. Place the light switch down on top of the paper (line up the light switch hole). Press the paper down firmly. On the paper which sticks out over the edge, make small cuts up to the edge of the light switch every 1/4 inch or so. Put Mod Podge on the underside of the switch and press these edges down firmly. Put light switch back on the wall using screws (you may need slightly longer screws to hold it on. 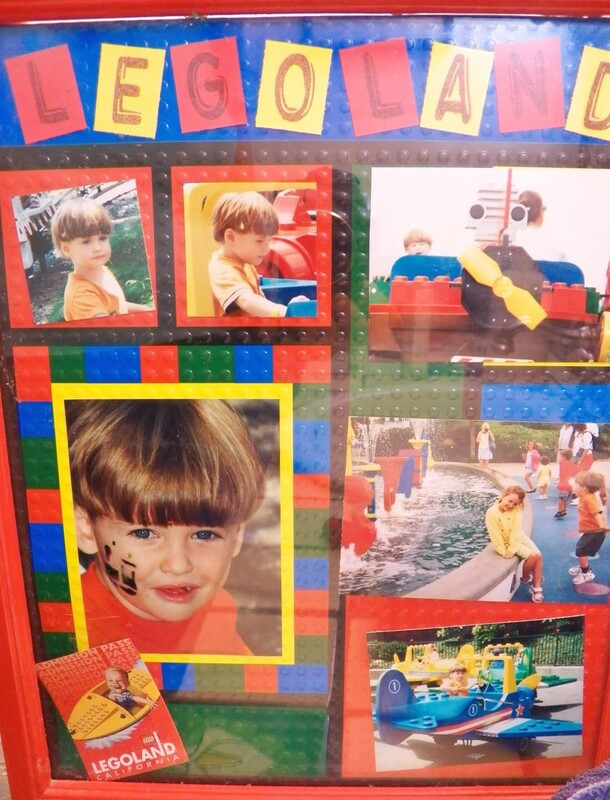 We had a lot of Lego pictures of my son playing with friends, having birthday parties and going to Legoland. I made a few scrapbooking pages from these photos and framed them to put in his room. That was a great way for him to remember those good memories while adding to the theme decorations. You can buy special 12" by 12" frames, or do like I did and take frames you already have, or buy inexpensively (I got mine at the Goodwill). I chose to do three frames to put across one wall of the room by my son's bed. Paint the frames in primary colors (I did one red, one blue and one green) using acrylic paints. Make your scrapbook pages. 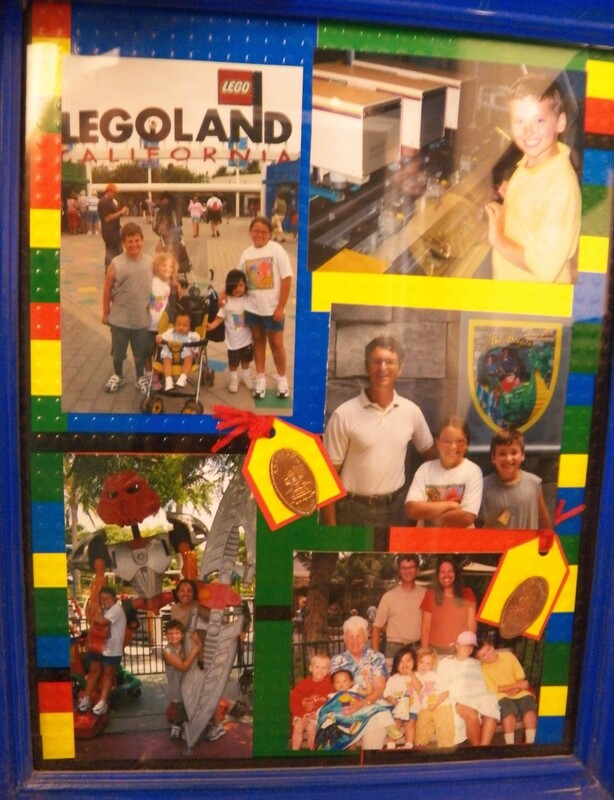 If you buy 12" x 12" frames, you can just put your pictures on the Lego paper with adhesive and put decorations on them. Since I didn't want to buy special 12" by 12" frames, I took the cardboard from the frame to help me measure. 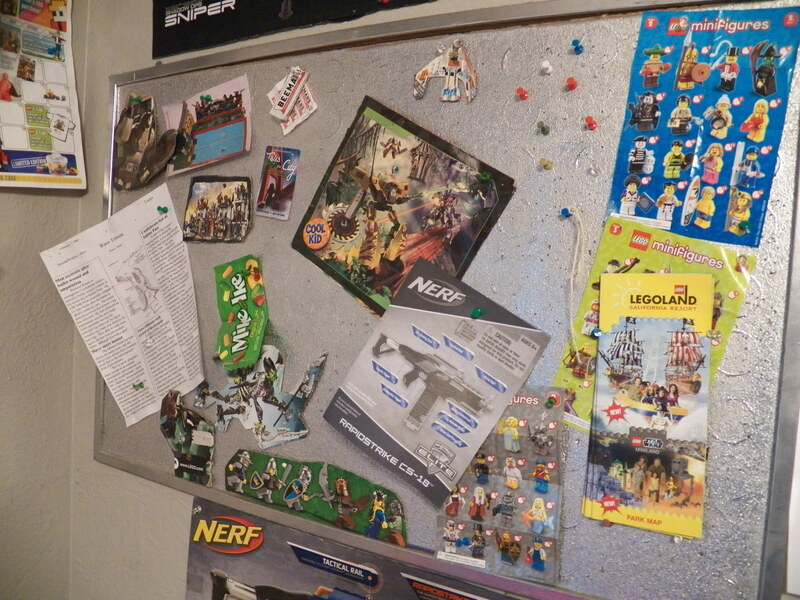 Then, I just taped the Lego papers together until they fit. Use adhesive or tape to hold the scrapbook page to the cardboard back of the frame, then put the frame, glass and scrapbook page together. 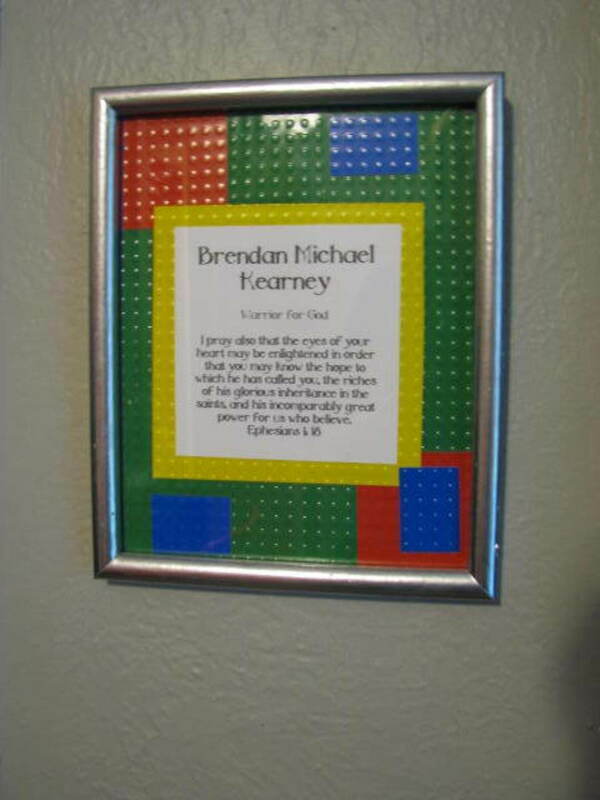 Decorate the frame by gluing on buttons, or glue on some Lego plates and your child can attach his own small creations to the frame for more decoration and personalization. 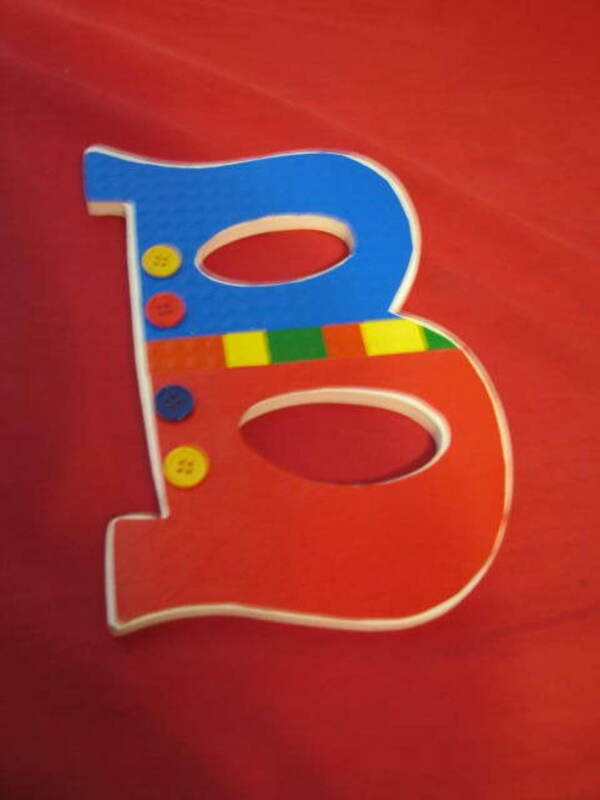 One way that kids can help decorate their room is to make decorated initial letters. You can find wooden letters at a craft store or at Amazon. You can just do the first letter in your child's name, their initials, or spell out their whole name or a favorite word, maybe "Lego?" This craft can be a good party activity too. Take the letter and put it upside down on the back of the Lego paper. Trace around the letter. Be careful you don't trace it so that the letter will be backwards. Cut out the paper. Put Mod Podge on the wooden letter. Place the paper on top and smooth with your fingers. Decorate the letter with buttons, stickers, or other decorations. 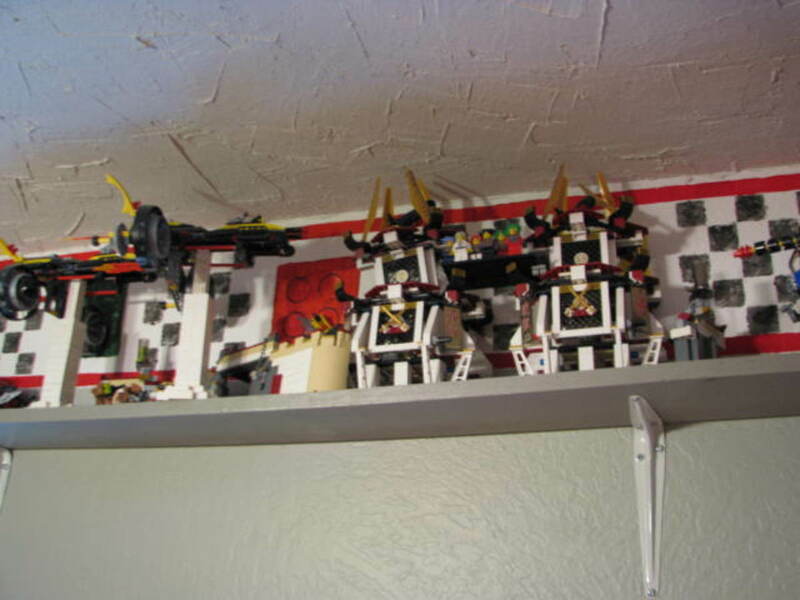 We got the idea of high shelves for displaying sets from an adult Lego fan. So we built shelves all around my son's room just under his border. 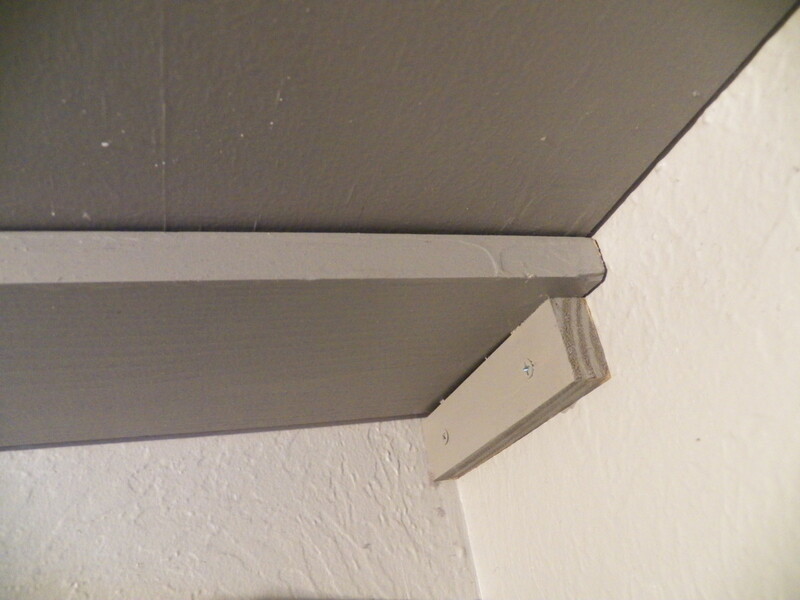 I made these very easily and cheaply by buying 1" by 10" wood, painting it grey to match his walls, and then installing them by using small pieces of wood screwed on to the wall at each corner. I added a few shelf supports in the middle of the room to keep the shelves from sagging. The whole project took me just a morning and my son has loved having his creations up on display. It has also encouraged him to keep his sets together and not lose the pieces. Red bedding with a black pillow and throw. I painted a corkboard with silver spray paint. Over the years he has had his room this way, we've moved the furniture around. We eventually had to change from having the loft bed when he got too tall for it. Now he has his bed on the floor and uses his desk for making Lego creations. 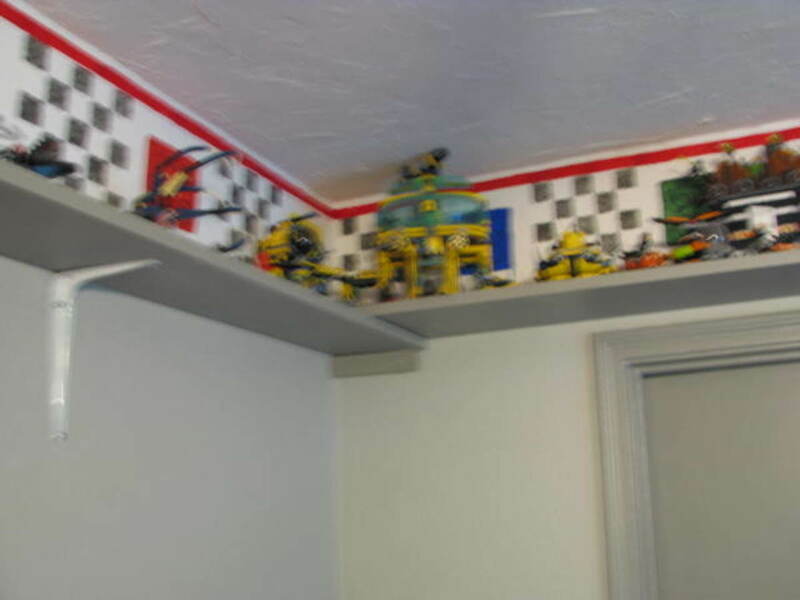 We created the theme room for my son when he was in about 5th grade, and although he has gotten interested in other things besides Legos, he has been able to incorporate these into his room. Since he is now in High School and is over 6 feet tall, we had to take out the loft bed. Now he just has a mattress on the floor. 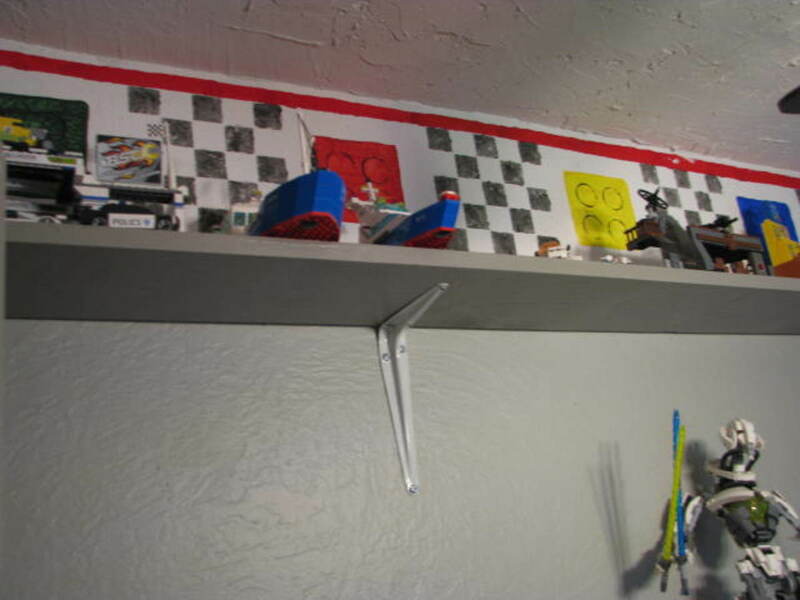 He has pinned up lots of his memorabilia all over the walls. It isn't as neat as mom would like, but as a scrapbooker, I can appreciate the fact that he has decorated his room with memories. At one time, the cork board was painted in primary colors like bricks. When he went more towards a chrome look, I just re-painted it with chrome paint. The brick outlines still showed through, so my son likes it a lot (when you can see it thought the things pinned to it!). Good luck creating your own theme room! 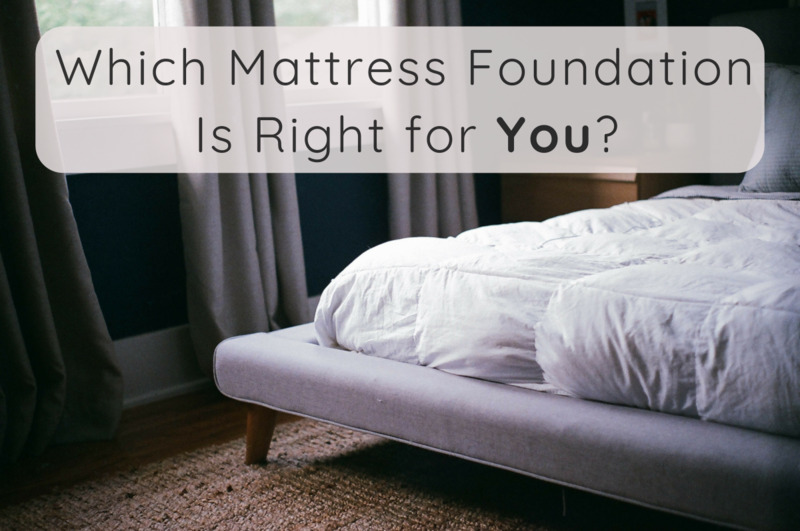 If you have any ideas, please share them below in the comments! The ideas in this article are very creative. It also does not hurt that they are inexpensive as well! The light switch is by far my favorite and so easy to do. Overall, this is a great use of space and fun for the kids. 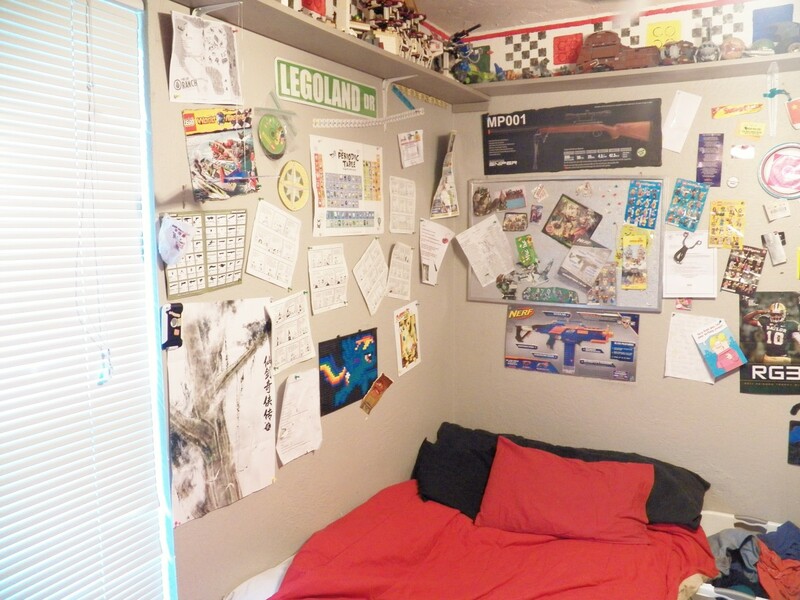 I wish I could have had a room of this caliber when I was a young boy. So many great ideas here! 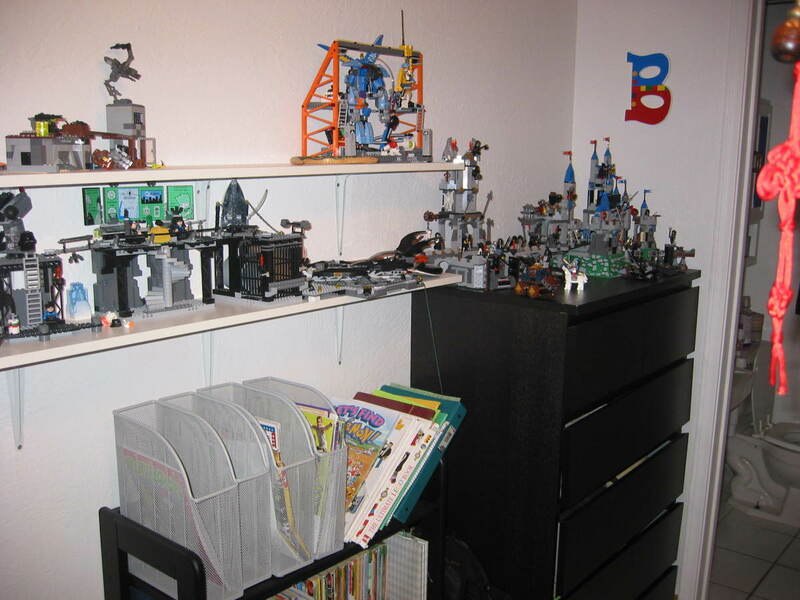 My son, 10, is borderline obsessive with Legos lol My husband and I have been thinking about a Lego themed room for him for a year or so. I think I'm going to send this hub to him so he can see for himself. Thanks for sharing! 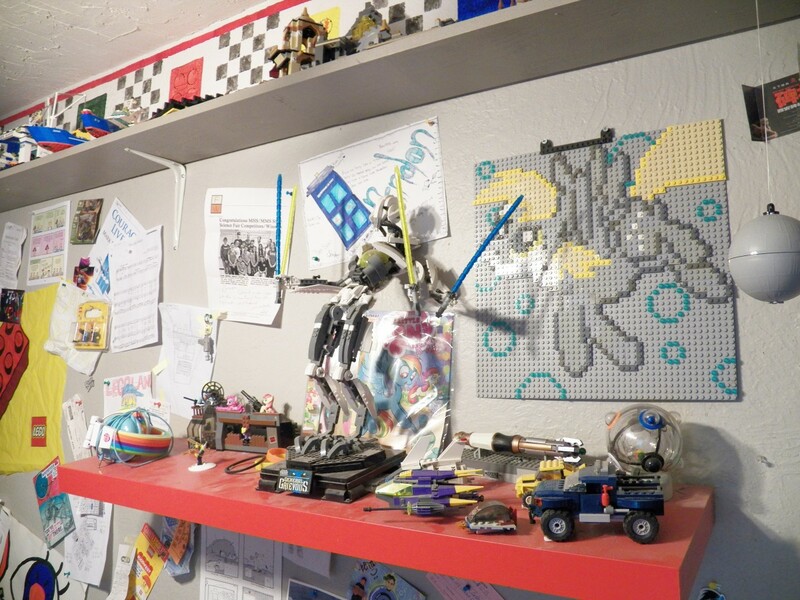 Thanks FullofLove--I actually bought my first batch of Lego Paper at a scrapbooking store near Legoland California. I was very happy to find it was available on Amazon, so that is where I buy it now. The sheets are also great for using as placemats at a Lego Party. Hum,maybe that is another hub! I've had probably 10 Lego parties between all my kids! Cute room! This is the first time I've seen and heard a Lego paper. I hope I could find it in stores around here. Very impressive hub. 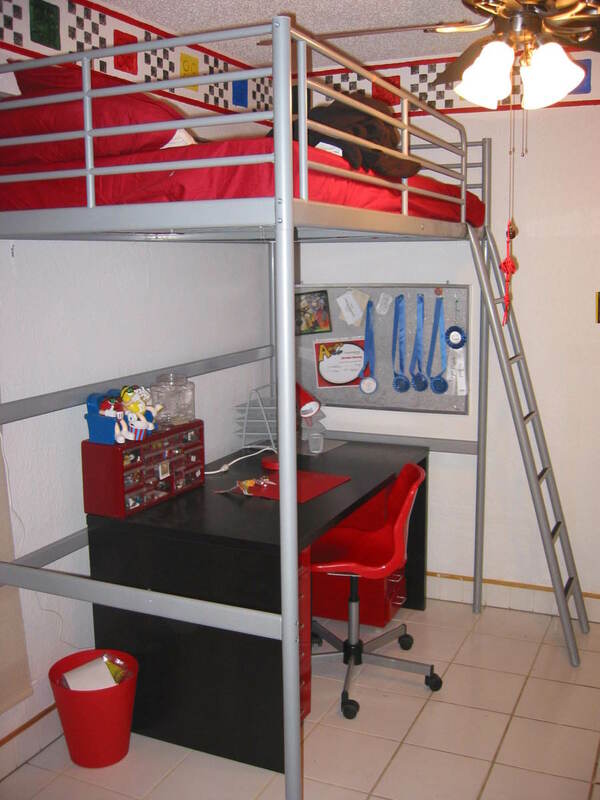 I love the use of space beneath the bunk bed. My kids would be envious if they saw this. Thanks for sharing! 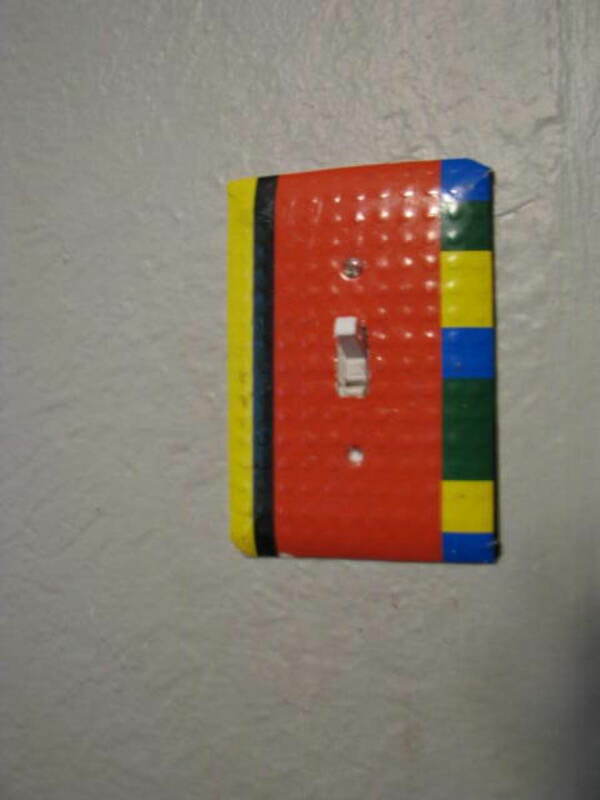 That lego light switch is brilliant. Love it! What a wonderful hub; voted up and shared.